Williams couldaa-wouldaa-shouldaa won World Titles in 1979 and 1981 to go with the ‘Jones Boys’ win in 1980. 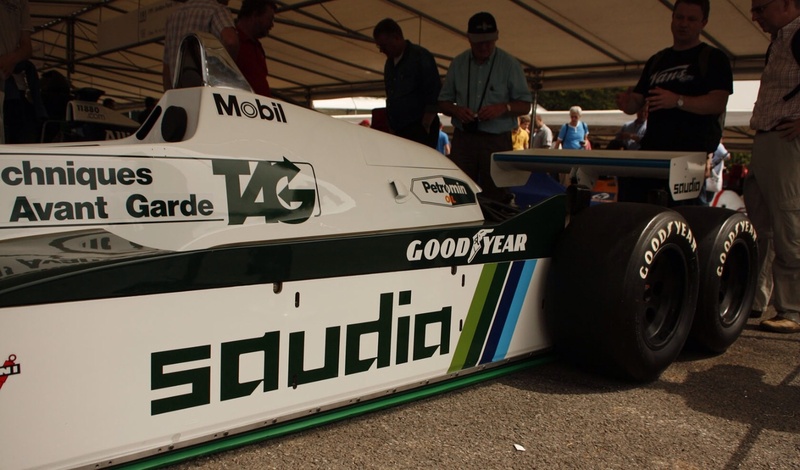 In ’79 the ground-effect FW07 arrived late and took a while to find the reliability to go with its speed apparent from the start. In 1981 team orders and more ‘cooperation’ between Jones and Reutemann would have secured a title for one of them instead of ‘none’ of them. The two ‘numero-unos’ caper seldom works does it? I am a Buddhist in some ways but I still love the way ole AJ totally crushed Lole at Vegas in that last round ’81 championship showdown. Sheer force of will and balls. Attributes the ebullient, combative Balwyn Boy had in spades. 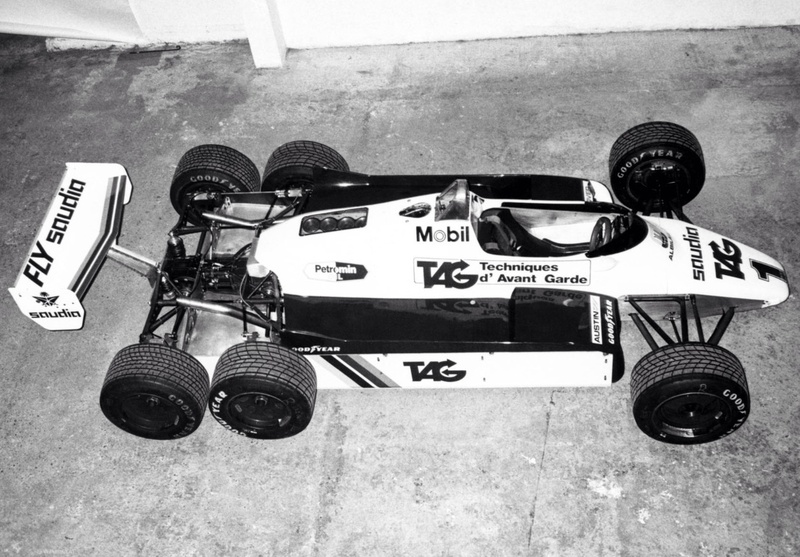 By late 1981 the turbo teams were finding reliability to go with their speed. Renault only missed out on the ’81 title because of unreliability, Ferrari were new to the turbo game but the engine was great even if the chassis was not. Brabham had formed a partnership with BMW. The best of the Cosworth runners was the McLaren MP4, which, with the very first carbon-fibre chassis was putting to the road all the venerable DFV had to offer. Maranello unsurprisingly knocked back William’s request for a customer Ferrari V6 turbo. 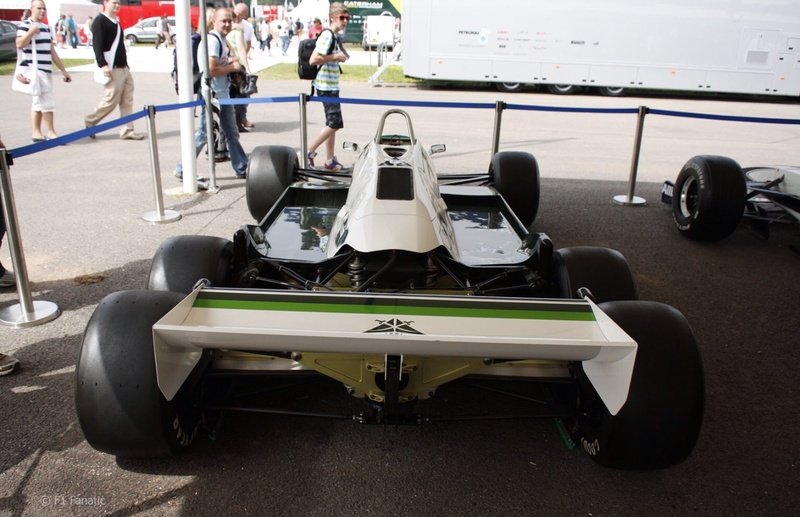 What to do was the question the Didcot hierachy faced as the FW07 series of cars were at the end of their development cycle? To make things worse, Alan Jones made a very late call to quit GP racing and become a farmer. He bought a property at Glenburn, in the Kinglake/Yea area of Victoria forcing the Williams team to shop around on the second-hand driver market. The population difference of 250 people in Glenburn and greater London’s many millions is a change in domicile of some scale! Frank and Patrick eventually signed Keke Rosberg to partner Carlos Reutemann. It turned out to be rather a good choice. Patrick Head set upon two design paths in parallel; the FW07 replacement ‘FW08’ and a six-wheeler project. By mixing the two projects, Head accounted for the six-wheeled concept in the FW08 design. 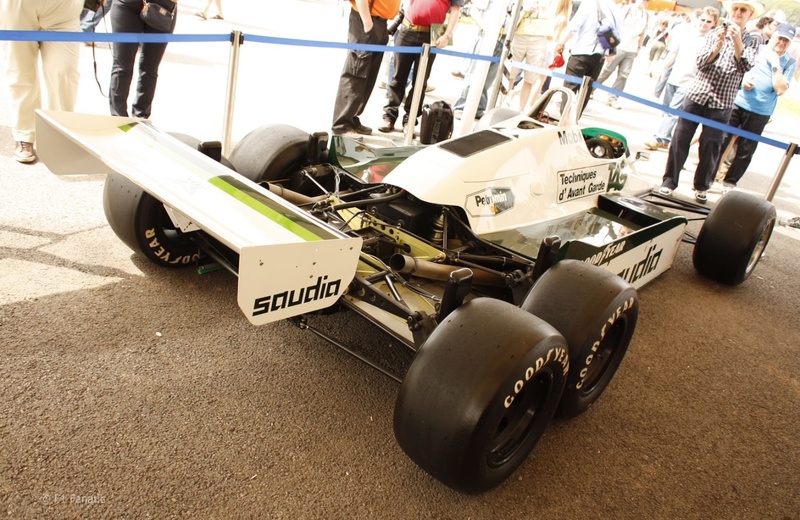 The FW08’s wheelbase was kept short to accommodate the addition of four-wheel-rear-drive, its short wheelbase is partially the explanation of FW08’s stubby looks. 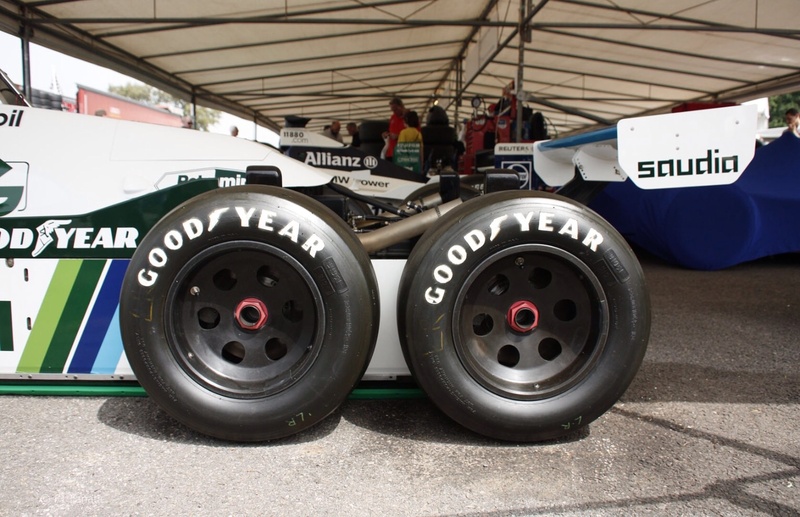 What follows is a truncated version of a great 8W: Forix article on six-wheelers, click on the link at the end of this article for an excellent summary of six-wheelers starting with the 1948 Pat Clancy Special and finishing with the 1982 Williams FW08D. In addition I have drawn on the recollections of the Williams six-wheeler designer, Frank Dernie in a MotorSport article. The Williams six-wheel configuration would be four smaller driven wheels at the back in a direct effort to improve straightline speed by getting rid of the big aerodynamically inefficient rear tyres and improve traction out of corners due to the increased rubber contact. A bonus was to allow the free flow of air along the sidepods all the way to the rear axle of the car. ‘As ground effects were permitted within the wheelbase of the car, Head cunningly interpreted this rule as being from front axle to the most rearward axle! In Head’s mind, these would be ground effects perfection. The leading rear axle was placed four inches ahead of its original place, with the driveshafts angled to cope. The most rearward axle was driven by an additional final drive added on the back of the transmission. Hewland provided assistance on the gearbox, using vital experience gained from Roy Lane’s March 2-4-0 hillclimber’ which you will recall was also two wheels up front and four down the back. Jones briefly tested the car at Donington Park in November 1981 shortly after winning at Las Vegas, but still decided against continuing his GP career. Its said the weather was so cold in Leicestershire that day that Jones had to pour hot water on his Jaguar door locks to get into his car. It’s not that the concept of the six-wheeler was poor, simply that AJ needed a break. He returned to Australia to race Formula Pacific and Sportscars but was back to Grand Prix racing soon enough, his decision to opt for the bucolic pleasures of country life in Australia was premature. ‘In November 1981, at a cool but sunny Paul Ricard Keke Rosberg climbed aboard the six-wheeled FW07 hack, which for reference purposes we shall call the FW07E, as its reported name (‘FW07D’) later became the designation for the regular 1982 FW07. Reports in Autosprint magazine led everyone to believe that Keke’s times at Ricard were unusually fast indeed, although many warned not to read too much into winter testing times. However, Alain Prost’s lap record of 1.04.5 had been set on October 26, just two weeks before Keke and his FW07D/E lowered it to 1.04.3 on November 7. Jonathan Palmer also tested the car at Croix-en-Ternois in the North of France to see what its performance would be like on a tight and twisty track, and matched the times set by the regular FW07C. Eventually though, the FW07D/E wasn’t used in racing as the team found a major obstacle to its ‘perfect’ ground effects – the lower wishbones of the rear suspension. So Head decided on incorporating this dilemma into the design of the FW08, which as stated above was predesigned to accommodate six wheels. The FW08 solution used fixed-length driveshafts that would be used as lateral lower location members as well, thus freeing the underwing tunnels from any obstruction’. 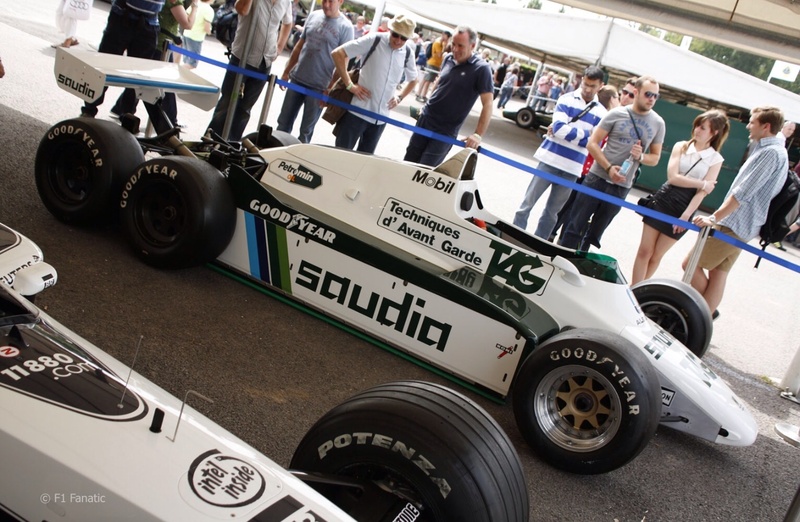 ‘Buoyed by the performance of the latest FW07 regular development, the FW07D, the team started the season with this car, ‘Lole’ immediately taking second after the super-license affair at Kyalami, with Rosberg fifth. While the politics continued unabated in Brazil, Williams were confronted by Reutemann’s shock retirement from racing but lifted by Rosberg’s strong second place at Long Beach, yet still behind Niki Lauda in McLaren’s miracle chassis. The Imola boycott allowed the team to prepare two FW08s for Zolder where there was more drama in store for the Grand Prix community. With the Renaults faltering yet again, Keke grabbed another second place, this time following home John Watson in the other MP4/1’. ‘In the following races Rosberg and new team mate Derek Daly continued to be beaten by the McLaren and the Brabham BT49D, while the turbo-engined Brabham won its first race. In France, turbos finished one-two-three-four. Obviously unaware of the final Championship result, the Williams team then pressed on with its six-wheeler project and during the summer of 1982 a new car surfaced. This time an adapted FW08-01 codenamed FW08D, hit the Donington Park track. Its four wheel drive times were stunning. In fact, they were so good that the FIA issued their 1983 regulations including a clause that outlawed six-wheelers and four-wheel drive’. Frank Dernie spoke of his FW08 six-wheeler design in MotorSport. ‘I managed a sufficiently rearward centre of pressure, without too much loss of the underbody, to do away with wings; the car had a slotted-flap type underbody, part of it around the exhaust, part of it in the normal place. I couldn’t have done that with a four-wheeled car. When skirts have to stop ahead of the rear tyres, you’re knackered’. ‘The lift to drag ratio of FW08 was 8.2, and the FW08B six-wheeler was not much more…But the final quarter scale model of the six-wheeler that would have gone into production had a lift to drag of 13 point something’. With neither front nor rear wing, any necessary trimming was to be supplied by a Gurney type flap at the bodywork’s rear’. Keke Rosberg, Jacques Laffitte, Jonathon Palmer and Tony Trimmer all tested FW08B as late as October 1982. ‘It was quite progressive’ said Palmer. ‘It was great fun to throw around, to get a bit sideways, because instead of one wheel losing grip, and, therefore losing 50% of your grip, if one wheel lost grip you still had three others giving you some grip’. The car showed promise on all types of track from the high speed sweeps of Silverstone to the twists of Croix en-Ternois. Dernie again ‘Patrick was sure that the only limitation would be, with four driven wheels pointing straight ahead, masses of power understeer. But after only a few laps of ‘Croix, Laffitte admitted he had forgotten it was a six-wheeler’. ‘If you get the weight distribution right for the tyres and make sure the aero is consistent, there is no reason why it wouldn’t feel like any normal racing car. To get the ultimate from it, though, tyres specific to the rear would have been required. At that time however, we were just running six fronts’. In a busy time for Williams GP Engineering Dernie was actively assessing active suspension, Rosberg was stringing together a consistent run in one of F1 nuttiest seasons, FW was courting Honda as an engine provider and as a result the six-wheeler slipped down the priority list. ‘We didn’t expect it to be banned. Though we thought that maybe it would be after everyone saw how quick it was’. ‘We didn’t have sufficient time or money to bring it to fruition. We only had one Hewland gearbox, for example. Its casing was completely different because the suspension mounts were different. The gear linkage was unique too. We would have to have made lots of new bits before racing it, and inevitably it was going to be a heavier than a normal car’. Williams’ efforts had come to nought. And with Keke suddenly picking up one useful placing after the other – outpacing the unreliable McLarens in the process – and taking his debut win at Dijon, the Didcot team stopped having reasons for arguing too strongly with the FIA. And they had their negotiations with Honda going on anyway. 8W:Forix ‘Joining them – as Lotus had done, as McLaren would ultimately do – instead of beating them became the new motto for the new Formula 1 era. It had no place for six-wheelers, just as it refused four-wheel driven turbine cars. Many years later, at the 1995 Festival of Speed, the Williams FW08D turned out one more time in the hands of Jonathan Palmer. On the hill at Goodwood it showed why it was outlawed before it got the chance to show it was a winner. The doctor comfortably set an FTD that was only narrowly beaten by Nick Heidfeld four years later, in a pukka 1998 McLaren’. The last sentence says everything that is wrong about modern F1 of course- the sameness of the cars as a consequence of rules which are way too prescriptive.